NASA's SOHO spacecraft can study the atmospheric layers of the sun that extend off its central body. Total solar eclipses gave humans the first opportunity to see this region of Earth's nearest star. Throughout human history, scientists have used the awe-inspiring event of a total solar eclipse to hunt for new information about the world not easily available through other means. From the discovery of one of the most abundant elements in the universe to insights about the nature of space and time, solar eclipses have provided natural laboratories for intriguing scientific discoveries. The sun may be the Earth's closest star, but this body's very brightness makes it a challenge to observe. The light from the solar body drowns out the fainter corona, the outer atmospheric layer of the star, a wispy region that becomes visible when the moon completely blocks the face of the sun during a total solar eclipse. Trying to understand the sun without seeing its corona would have been like trying to learn about Earth without ever seeing its atmosphere, said Jay Pasachoff an astronomer at Williams College in Massachusetts. For more than 45 years, Pasachoff has studied solar eclipses, both the science they can produce today and what scientists have learned from them throughout history. "The corona is a major part of the sun, though it is hidden from us on Earth's surface except for the glimpses we get every year or two at eclipses," Pasachoff said in an email. "...at the fourth hour of the day ... darkness covered the Earth and all the brightest stars shone forth. And it was possible to see the disk of the sun, dull and unlit, and a dim and feeble glow like a narrow band shining in a circle around the edge of the disk." A drawing of the 1860 eclipse reveals the first suspected image of a coronal mass ejection, a collection of charged particles ejected from the sun. During each 11- year solar cycle, the sun transitions from its solar maximum to solar minimum, when the amount of charged particles streaming from the sun in the form of solar wind, coronal mass ejections, and flares reaches its highest or lowest point. Before scientists could send satellites to space to study the corona, which became possible during the space age, researchers used solar eclipses to probe how the corona varied over that cycle, Pasachoff said. According to NASA, eclipses also provided insights into coronal mass ejections (CMEs), material from the sun that is spewed into space via enormous explosions. If a CME collides with Earth, the event can harm power and communication systems, as well as astronauts in space. With the sun blocked during an eclipse, these clouds of charged particles could be spotted. "In some cases, what we now believe to be a coronal mass ejection was seen during an eclipse," C. Alex Young, associate director for science of NASA's Heliophysics Science Division, told Space.com. The first record of a CME in progress was made during the total solar eclipse of July 18, 1860. Solar prominences, the large accumulation of cooler gas held in place in the atmosphere by the sun's magnetic field, were also first recorded during a solar eclipse. The University of Montreal's website "Great Moments in the History of Solar Physics" calls the description of the May 1, 1185, solar eclipse found in the Russian Chronicle of Novgorod "the first fairly unambiguous description of prominences." The sun's magnetic fields drive CMEs and other forms of space weather. Although magnetic field lines can't be directly seen, Young said that the charged particles that make up the corona trace the magnetic field lines, making them visible. So rather than a diffuse gas, the corona appears to have twisting, moving jets and lines running through it. Observations of the corona can then help scientists better understand the primary drivers of the space weather that can affect Earth and missions to other worlds, Young said. In 1868, French solar physicist Jules Janssen traveled to India to observe a solar eclipse. By examining the light streaming from the sun's chromosphere (another layer of the atmosphere that lies closer to the sun's body than the corona), he and British astronomer Joseph Norman Lockyer independently discovered a new chemical element. He named this new find after the Greek word for sun, "helios," calling the new find "helium." Along with hydrogen, helium is one of the most abundant elements in the universe, but it wasn't spotted on Earth until 1895, marking the first time an element was discovered on the sun rather than on this planet. Soon after the discovery of helium, American astronomer Charles Augustus Young and Scottish-born astronomer William Harkness independently discovered what they thought was another new element, which they called coronium, during the 1879 solar eclipse. 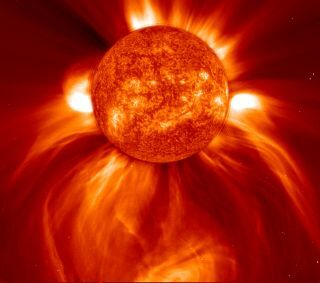 According to Canada’s University of Ottawa, it took another 60 years for scientists to determine that the coronium lines were instead caused by iron at very high temperatures, suggesting that the corona reached nearly 3.6 million degrees Fahrenheit (1.9 million degrees Celsius or 2 million degrees Kelvin), even though the surface of the sun is only about 10,000 degrees F (5,538 degrees C). This discovery is counterintuitive, because the body of the sun is the source of its heat; it's as if the air around a bonfire were hotter than the fire itself. Scientists have not yet fully resolved this puzzle. "The solar corona is hotter than the visible surface. Wow!" Young said when describing what, to him, is the most interesting historical finding related to eclipses. During the 1970 solar "eclipse of the century," NASA launched 32 suborbital sounding rockets to conduct meteorology, ionospheric and solar physics experiments. One of the most surprising discoveries, Pasachoff said, came when scientists looked at the corona and spotted a wavelength of light created by hydrogen atoms. Reaching millions of degrees, the corona had previously been thought too hot for hydrogen atoms to survive. Instead, they found that hydrogen was so abundant in the corona that some of it managed to survive in atomic form, Young said. Today, scientists can create artificial eclipses with telescopes on Earth and in space by blocking the sun's light with an instrument known as a coronagraph. But Young said that these instruments have technical limitations "and still cannot come close to what nature provides during an eclipse seen on the ground." The shadow of the moon falls on the surface of the Earth during a total solar eclipse in 2016. This image was captured by the NASA-NOAA Deep Space Climate Observatory (DSCOVR) spacecraft. Eclipses don't just teach humans about the sun; they also provide instruction about planet Earth. According to Nordgren, who is also a professor at the University of Redlands in California, over 2,000 years ago, solar and lunar eclipses helped scientists determine the size of the moon and that Earth is a sphere. Earth’s rounded shadow on the moon during a lunar eclipse revealed its shape, but calculating the size of the sun and moon took a bit more mat. Greek astronomer Aristarchus used lunar eclipses and geometry to measure the size of the moon, then used solar eclipses to extrapolate the size of the sun. Because solar eclipses are so awe-inspiring, a wealth of written records usually surround them, and these accounts can help date events in history according to the Institute of Physics. For instance, the Greek historian Herodotus wrote of an eclipse occurring before the Persian invasion of Greece, which had been estimated to occur around 480 BCE. English astronomer John Russell Hind found that the area would have seen an eclipse on Feb. 17, 478 BCE, helping narrow down the timing of the historically significant event. A total solar eclipse provided one of the first known instances of "citizen science," when members of the public have assisted in conducting scientific experiments. In his book, Nordgren described how Edmond Halley, the same man who discovered the comet that bears his name, engaged the public during the April 22, 1715, eclipse. Halley blanketed England with posters asking people to use their pendulum clocks to record how long the eclipse lasted at different locations, then mail him the results. He used the information to improve measurements of the moon's orbit and make better predictions about when future eclipses would occur. With modern instruments, scientists can use solar eclipses to study the nature of Earth's own atmosphere. Ultraviolet light and X-rays from the sun can strip electrons from atoms in the Earth's upper atmosphere, in a process called ionization. Ionized particles tend to have an electric charge and one of the uppermost parts of the atmosphere, called the ionosphere, is defined by these ionized and electrically charged particles. The ionosphere requires a constant influx of X-rays and ultraviolet light to remain charged (otherwise the atoms and electrons will recombine into neutral atoms and molecules). When the sun sets the upper layers of the ionosphere are ionized by charged particles from space called cosmic rays. "What this means is that some parts of the ionosphere — the lower parts — actively require the 'lights to be on' to exist," Bamford told Space.com by email. "Hence, they are only there during daylight and disappear at night." During the 1999 total eclipse that occurred over the United Kingdom, Bamford organized a project to encourage eclipse watchers to track these changes during the eclipse. All an observer needed was a radio. A total solar eclipse can act like a snapshot of night because charged particles from the sun no longer stream through the ionosphere, and as a result radio waves can bounce farther than they would during regular daytime hours. The transition from darkness to light happens faster during an eclipse than over the course of a typical sunset, and even though the sun may only be completely covered for a few minutes, the ions in the atmosphere lose their charge and reconnect during that time, making it possible for radio signals to cross long distances (just like they do during nighttime hours). Bamford said the change in how far the radio signals can travel comes "pretty well instantly in proportion to the loss of light," then returns to normal when the sun reappears in the sky. "What you hear is radio stations you'd ordinarily only hear at night, fade as … the eclipse [occurs], then fade out as the shadow passes," she said. "This does allow the general public to 'listen to the total eclipse,' even if they are not beneath the totality." Understanding the nuances of how the atmosphere is altered by the rising and setting of the sun can help radio broadcasters avoid pumping radio signals out with more power than needed, which Bamford said "unnecessarily pollutes radio bands far afield and creates interference." During a total solar eclipse, different parts of the United Kingdom receive different amounts of sunlight, which should also influence so the ionosphere, and hence, how far radio waves can travel. By tracking how far a known signal travels during a solar eclipse, scientists could learn about how the presence or absence of sunlight influences the different radio frequencies, she said. During the 1999 eclipse, Bamford's project requested that observers tune into a radio station in northern Spain that was detectable in the evenings in the United Kingdom, assuming the frequency wasn't obstructed by other local stations. Participants were asked to write down whether they could hear the station, and send in their responses along with their postcodes. In the paper describing the project, Bamford stressed that the experiment was suitable for people of all ages, including the visually impaired, and didn't stop participants from viewing the eclipse. Even if local weather conditions prevented people from enjoying the eclipse by eye, rain and cloudy skies would not affect the radio waves, she said. The project received 1,700 responses by mail, in addition to more-detailed measurements by radio amateurs, who had access to more sophisticated equipment. Wedged between the southern region that could always hear the station and a northern region that could hear it only during the eclipse, there was a stretch across the middle of England that couldn't hear the station during the eclipse. This revealed what Bamford called "a skip-distance effect." For the upcoming 2017 eclipse, Bamford said she thinks some amateur radio clubs might be doing various experiments, and ionospheric researchers will be making special observations, but no one has yet contacted her about performing a similar project by radio. Solar eclipses can also reveal insights about other planets in the solar system. When the sun is covered during the upcoming Aug. 21, 2017 eclipse, Mercury and Venus will both be visible, as will Mars and Jupiter, according to Earthsky.org. Venus will appear about half an hour before the sun disappears, while Mercury will be revealed from about 30 seconds before totality until about 30 seconds after it, when the moon totally covers the disk of the sun. During the 2017 eclipse, at least one set of astronomers will take the opportunity to take the temperature of Mercury while the star is hidden behind the moon. Eclipses have also provided the opportunity to search for other worlds. In the 19th century, scientists noticed that Mercury wasn't traveling quite the way it was predicted to: The planet's closest point to the sun in its orbit slowly shifted over time, slowly moving around the star. Scientists assumed that an unseen planet, which they called Vulcan, sat between Mercury and the sun, with the unobserved planet's gravitational pull shifting Mercury's orbit . When various eclipses hid the sun, astronomers searched in vain for the missing world. During the total solar eclipse of July 29, 1878, astronomers flocked to the United States' Rocky Mountains to hunt for the hidden planet, but never found it. It wasn't until November 1915 that a young Albert Einstein killed off Vulcan for good when he presented his theory of general relativity. A massive body can bend and distort "space-time" (Einstein's name for the fabric of reality, which weaves together three-dimensional space with time). As Mercury orbits the sun, the curvature of space caused by the sun's gravity would cause the planet's orbit to shift very slightly, Einstein's theory predicted. According to general relativity, the curvature of space-time could explain the strange wobbles of Mercury far better than a hidden planet could. In 1919, English astronomer Arthur Eddington traveled to the west coast of Africa to test another prediction that came from general relativity: that the path of light itself bends around a massive body. By studying how light from the stars behind the sun bent, Eddington and the eclipse provided observational evidence for Einstein's complicated theory. While for most people, a solar eclipse can be a once-in-a-lifetime, awe-inspiring sight, it is clear that these phenomena can also reveal a wealth of information about the universe.